Theirs is a love that can never be. 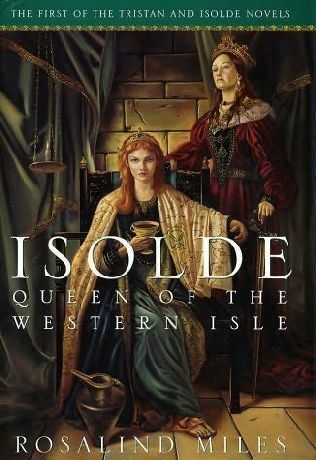 Isolde is the daughter of the Queen of Ireland, whose champion has just set sail to conquer Cornwall. Tristan is the nephew of Mark, King of Cornwall; he defeats Ireland's champion and earns the eternal hatred of the Irish Queen. Tristan has sworn his allegiance to Mark, while Isolde has just agreed to marry the King of Cornwall to guarantee peace between their lands. Can they see each other every day without betraying themselves? Or will the love they share be too much to resist? This is another book that I read a while ago (I think I must have read it soon after it was published in 2002 or 2003) that I remembered enjoying, but that really disappointed on re-reading it. I didn't really buy into the romance between Isolde and Tristan, which is a major problem given they're supposed to be the main focus of the story. To me it seemed like there really wasn't any time spent on developping the relationship between them, like we're just supposed to accept that the Goddess has destined them for each other, prepared them for each other and bang they're in love! I'm not going to spend much time ranting on the historical problems the book has, or the fact that the people in the book worship a Goddess outside the Irish / British / Celtic pantheon of Gods. It's annoying, but I have mostly gotten used to it. In fact, I would be surprised to find a book about the legend of Arthur where the non-Christian characters actually worshipped setting appropriate gods. I disliked how Mark was portrayed. It would be nice to read a story with a 'love-triangle' where you aren't actively cheering against one side. I would like to see the conflict in the character who has to choose, or to really feel for the character who's being betrayed. Since Mark is so obviously meant to be the 'bad' guy (or, at least, the guy on the losing side of the triangle), it's hard to feel sympathy for him. Sometimes I feel like writers only write triangles like this because they can't pull off writing a triangle where you really feel for all characters involved. I find it odd that, for an author who seems to be, I don't know if feminist is the right word, but at least very least egalitarian, very interested in women's role in history (and, yeah, I don't think I'm explaining this right at all) that I find some of her female characters to be a little bit insulting. I can see that she wants to write strong female characters, but some of them just don't work for me. I'm not sure if it's because I've read the book before and I had half-remembered the plot, but I thought the outcome of King Arthur's plot was pretty obvious. I also thought it moved along at a snail's pace for most of the book. And yet, I didn't hate the book. It was just disappointing.